Showmen have always been an inventive breed. They even invented words like "Transperillusion" which we see used on the bannerline of this small magic show in 1910. One or two Wagon shows like this one provided occasional entertainment to the residents of small farm towns all across rural America at the turn of the century. Here amid the dust and residual horse dung, people gather round on Dayton Iowa's main street for the 'bally' during "Carnival Day's". (You can just see the top of a Conderman Ferris Wheel over the right hand banner.) 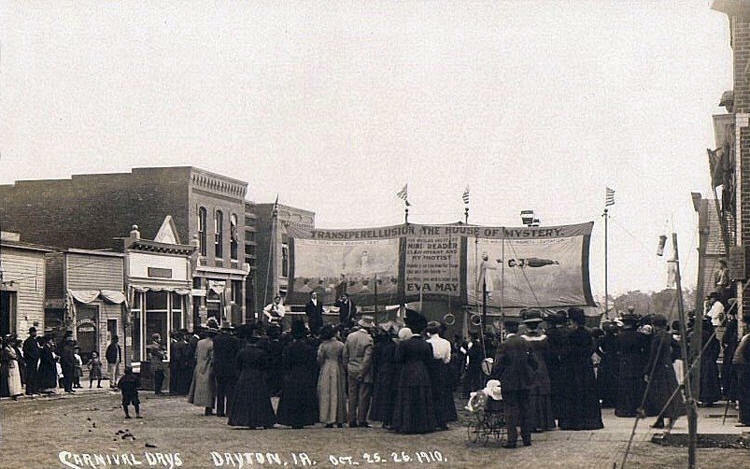 This may well be the only public entertainment the good folks of Dayton got to see for months.